"Luckily we are still able to showcase three other exciting and fascinating art pieces to the public," Alici, the creative director of Istanbul-based new media studio Ouchhh, told the Global Times on Saturday before the opening of the Comic AI exhibition - the company's first in China - at the Yangtze River New Financial Creative Block. "Good things do come to those who wait. 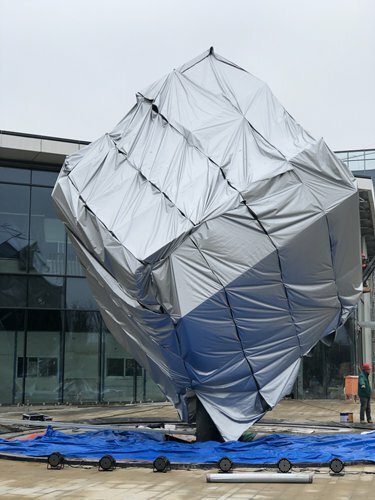 We will surely unveil it days later." Working with their partners around the world, Ouchhh explores the boundaries of art by exploring the relationship between architecture, art, science, technology and new media arts. Comprised of three sections, Form, Light and Space, the artwork applies the concept of machine learning to data acquired by Nasa's Kepler space telescope, which has traveled in space for 9.6 years, confirmed 2,662 planets, documented 61 supernovae as well as observed 530,506 stars. According to the artist, the cube-like installation transforms the Kepler data from NASA into signals and then converts these into animated visuals that are projected on its surface, which makes it possible for the public to plunge into the fascinating world of space discovery by observing exoplanets - planets that orbit around other stars. Inspired by space and science movies, Ouchhh is constantly looking for projects that are "cool and fascinating." By taking this concept one step further, the artist hoped this artwork will act as a gateway between our planet and other possibly habitable planets in the universe. According to Michael Goo, founder of Ouchhh's Chinese partner TRU-M studio, Data Gate will collect messages from the public through website www.datagate.space and broadcast them into outer space as greetings to other planets. "We are not scientists. So we have to learn before we can understand what this data means. We are working with NASA to find ways to make this easy for the public," said Alici. He also mentioned the interesting news that mysterious radio signals have been detected in faraway outer space. "What a coincidence," he added. Goo told the Global Times that Nanjing is the first stop on Ouchhh's China tour, the details of which they are still working on but may include Beijing or Shanghai. In addition to AI technology, Ouchhh often explores other mediums for their creations, which range from animated films to music. Another artwork at the exhibition explores the connections between mind and music by using technology to answer the question: "What are musicans thinking?" 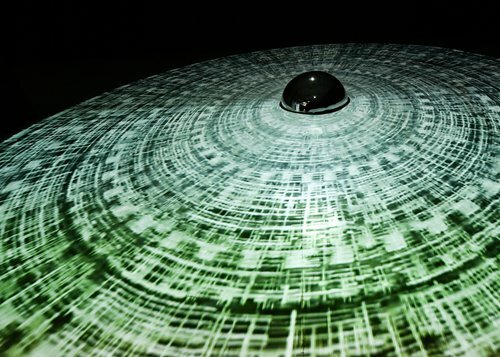 The Real-Time Generative Installation Performance Of Electrical Activity In The Musician's Brain exhibit monitors in real-time the changes in brain wave activity experienced by musicians as they perform and transforms them into beautiful visual displays. 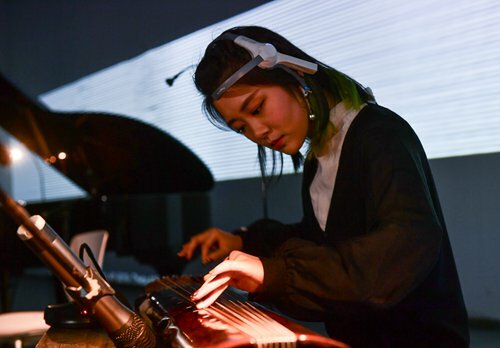 Wearing sensor gadgets wrapped around their heads, Chinese pianist Ma Chen, pipa (Chinese lute) performer Wang Yayu and guqin (Chinese zither) player Chen Shijun staged a concert in front of a giant LED screen for the exhibit. Using an electroencephalogram, the musicians' delta, theta, alpha, beta and gamma brain waves were transformed into data showing their emotional state, focus and attention as well as some auditory and neural mechanisms and projected on a screen behind them. "Audiences can see their emotions at the same time while they are performing. Brain, music, then visuals. I think it is a fascinating thing for us," Alici said, noting that he found the Chinese instruments impressive as they showed quite different results from when they did the same experiment in Austria with Western instruments. Walking into Comic AI, the first thing visitors see is the installation work Stardust, an interactive cosmic gateway that explores the basic building blocks of the universe. "We are all made of stardust and almost every element on Earth was formed at the heart of a star," said Alici, adding that Ouchhh shows audiences the connections they have with the universe that they would otherwise never see. Comic AI also has on display the company's popular work AVA V2, which won it a Red Dot Award, an Art Directors Club award and an award at the 10th Annual International Design Awards in 2017. Inspired by the iconic work of Buckminster Fuller, AVA V2 was created by using projection mapping on a hemisphere, which requires the installation to have six projectors. The company developed its own software which enables the mapping to be projected in 360 degrees.